There has been a great deal of discussion about offensive branding in the beer industry recently. Not that it's a new thing. Some of us have been talking about it for years. But it is certainly gaining momentum now. In the current social climate people have less and less tolerance for discrimination and exclusion. After all, it really isn't asking all that much to treat everyone equally is it? At the Brewer's Congress in November 2017 the Portman Group was referenced in numerous presentations. Speakers from breweries whose products had been reported to the Portman Group for breaching their Code of Practice (on Naming, Packaging and Promotion of Alcoholic Drinks) discussed the process of responding to these complaints. Later on we had Alistair Taylor from the Advisory Service at the Portman Group give a presentation on the role of the organisation and how they can benefit breweries. 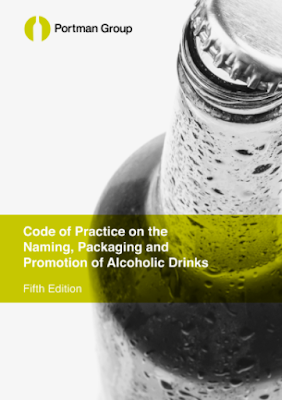 Essentially they exist to regulate the packaging of alcoholic products via their code of practice. In hindsight, there was nothing wrong with the overall message in this presentation - publicising their role and explaining how they can help breweries is definitely something the Portman Group should be doing. But in the heat of the moment this message was a little lost. When the presentation displayed a complaint about a beer (Wye Valley Brewery's Dorothy Goodbody's Wholesome Stout) which had been reported for breaching section 3.2 (d) of the code (a drink should not... 'suggest any association with sexual activity or sexual success') this was greeted with disbelief by the audience. The Congress had begun that day with Jaega Wise's presentation on women in the beer industry, including many examples of offensive packaging: this audience was not prepared to sit back and accept that this particular complaint had not been upheld because the packaging didn't breach the code. If the audience found the packaging offensive then how could this not be in violation of the code? The answer is that the code in its current form mentions sexual references on beer packaging only within narrow margins: a product should not suggest that it makes the consumer more attractive or that it leads to 'sexual success' which is actually quite an unpleasant sounding, masculine phrase. Possibly even a little dated. When I started reading through previous complaints I was shocked to see that the Wye Valley Brewery complaint is the only one the Portman Group have ever received concerning sexist packaging. I have seen and heard many complaints about lots of different examples of sexist and offensive packaging. If by any chance you haven't seen enough of these already you need only visit Pumpclip Parade. It seems unbelievable that only one of these examples has ever been reported to the Portman Group. Is that because people are not aware of the role of the organisation? Are they unaware that members of the public can report products directly? Or is it because even if they did report a product the code isn't fit (in its current state) to deal with these complaints? j. contain derogatory or demeaning text or images." Hopefully we will reach a broad consensus across the industry with the Portman Group code providing a minimum standard which all producers of alcohol are required to meet, with a similar marketing codes from SIBA, and supportive policies from CAMRA and the London Brewers Alliance. It is important that all relevant groups are on the same page otherwise we might end up in a position where a particular product's branding is deemed acceptable by one group but not by another. It is no coincidence that the Advertising Standards Agency conducted an evidence-based review of gender stereotyping in advertising last year. You can read the full report here Depictions, Perceptions and Harms. It's very interesting stuff. If you dislike those product adverts on TV which display men as incapable of performing the simplest of household tasks, you're going to like this. Castle Rock's Elsie Mo is a golden ale which first appeared in 1998, featuring 'pin up' artwork on the pump clip. In 2007 the brewery chose to digitally enhance the pin up a la Lara Croft and then in 2014 they decided to 'modernise' the artwork to show a woman in a pilot's uniform, kicking up her legs to reveal stockings and suspenders. Eventually in January 2018 Elsie Mo became a pilot, who can be seen flying a plane (whilst fully clothed). You can read the full story directly from the brewery. Following some criticism of their branding at the close of 2017 the brewery opted to change their labels - not because they felt they got it wrong the first time, but because it was affecting sales. Some of the responses to these positive changes made by breweries have been predictable but are still a little disappointing. The title of this blog post is a direct quote made in response to the Station 119 Facebook post announcing their new branding. Sure, it's laughable that some people think that way, and yes these dinosaurs are in the minority, but in too many cases there is a spiky barb of misogyny underneath. So the work is far from over.